Practice Area: Great place to practice your short game. The grass tee driving range is so-so, but the putting green is huge and kept just like the course. The chipping green is also mown like a real green and offers about 40-50 yards of fairway to practice from, as well as a large sand bunker. One of my favorite places to practice. 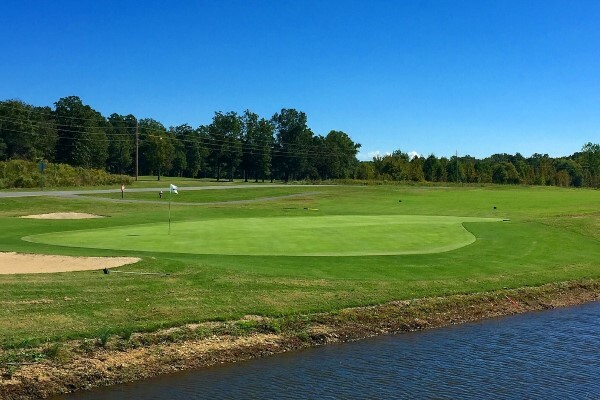 Description: Hidden among the farms in Union County, Charlotte National winds through the woods, with no neighborhood homes to intrude on golf. A very diverse layout, with the full range of challenges: length, water, elevation, wind, and fast greens. This course is 5 minutes from my house and so it's my go to for an emergency round or practice session. The clubhouse guys are very friendly and flexible to fit you in. B-Man's Take: Fun course, off the beaten path. Good mix of difficulty throughout the round, but the last 3 holes are brutal. This course is kept in very good shape and the greens always roll true. My favorite hole is #15, a long dogleg left par 5 with a second shot over a creek and a big tree in the middle of the second fairway. I have a few hell holes on this course, including the closing 3 holes, but the one that always seems to get me is the #1 handicap hole, the long par 4 #5, with water on both sides of the fairway. 6/7/18 - Quick update from playing 9 holes yesterday - they've sprayed the greens to kill them off before the switchover to bermuda. That has made them very thin and lightning FAST! If you enjoy putting on glass or Augusta-style green speeds, go play Charlotte National this week. The greens probably have another week of playability and it was a fun challenge not to 3 or 4 putt! Also, they've mown down spots on a few holes for the temporary greens so you can sorta see how the course will play in a few weeks. GolfHoles.com - Photo tour and course information.